Wind Advisory in effect until 6:00 pm CST for Colbert, Cullman, Franklin, Lauderdale, Lawrence, Limestone, and Morgan counties. 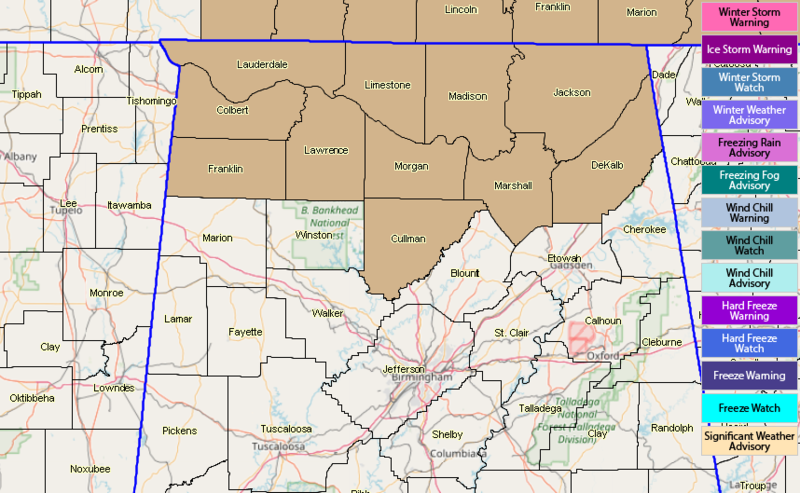 Wind Advisory in effect until 8:00 pm CST for DeKalb, Jackson, Madison, and Marshall counties. Winds will be out of the southwest at 20-30 MPH with the potential of gusts reaching 40 MPH. Those gusty winds will blow any unsecured object around. Some tree limbs could be blown down and a few power outages could occur. Driving may also become difficult for any high-profile vehicles traveling east or west.